The rising popularity of over-the-top video offerings and TV Everywhere services continues to transform the media and entertainment business. Whether through pure-play OTT services from dedicated providers, catch-up TV offerings from broadcasters or authenticated TV Everywhere services from pay-TV operators, the ability to access content on any device, anywhere is now firmly ingrained in consumers expectations and viewing habits. The growth of OTT video consumption and TV Everywhere adoption offers content providers and service operators tremendous new opportunities to engage their audiences and further monetize their content, but also creates operational pressures that require fresh approaches to their workflows. This is particularly significant for broadcasters and service providers who must integrate the workflows for these new offerings with their existing television infrastructure. While OTT services and TV Everywhere have very different business models, they share many common operational challenges. The demands of OTT and TV Everywhere at scale are reflected in the extensive media processing required to bring expanding content volumes to a diverse array of viewing devices. A recent SNL Kagan analysis of TV Everywhere offerings from leading western European pay-TV providers shows 79% targeting at least three viewing platforms (such as smartphones, tablets, smart TVs, game consoles and PCs), each with many device variations within it. Pure-play OTT services often target even more, including dedicated streaming media players. Though many devices share common characteristics, they vary in their support for video formats, wrappers, metadata and the adaptive bit rate (ABR) delivery protocols needed to provide reliable viewing experiences over varying network conditions. Delivering optimal media experiences across this broad range of devices requires creating and managing parallel outputs supporting many different combinations of specifications. Of course, profitably bringing content to multiple devices is not just about transforming video into varying formats. Direct integration of capabilities such as automated quality control (QC), loudness compliance and branding is necessary to maximize efficiency. The ability to integrate video processing operations directly with the organizations business systems is essential in enabling new monetization opportunities through applications such as addressable advertising. Seamless, automated management of the entire workflow including tight integration of both live and on-demand OTT or TV Everywhere operations with any existing traditional television workflows is crucial to efficiently deploying, maintaining and operating the services. Just as important, organizations need their multiscreen operations to be agile enough to respond quickly to changing market dynamics and new revenue opportunities. Every new video-capable device, technical standard or business opportunity may force service providers to adapt their operations, and they need to do so without throwing away their existing investment or disrupting their ongoing operations. Addressing all of these challenges requires a new approach to media operations. Flexible, software-defined networks and workflows are essential for media companies to efficiently scale to new opportunities and quickly launch OTT or TV Everywhere services. At Imagine Communications, our software-defined workflow (SDW) framework enables service providers to easily customize and extend their workflow processes while integrating seamlessly with their existing infrastructure and providing a smooth path to virtualization and the cloud. Meanwhile our unique, hybrid approach to software-defined networking (SDN), which bridges off-the-shelf IT solutions with baseband infrastructure, dramatically improves the way video is managed through facilities by allowing the entire bit flow to be software-mapped changing the bit flow while enhancing the workflow. We further bolstered our SDW roadmap and solution portfolio with our April acquisition of Digital Rapids, leading to the launch of our Xenio¢ workflow management foundation and SelenioFlex¢ software-based media processing solutions. Xenio enables broadcasters and service providers to design, deploy and manage customizable, software-defined workflows that can be quickly scaled and adapted to capitalize on new service opportunities. 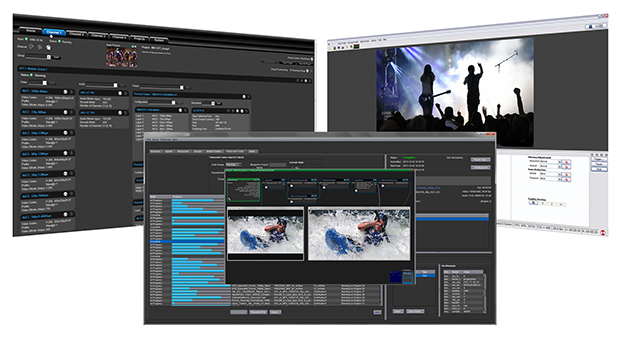 SelenioFlex provides flexible, high-quality, live and file-based encoding, transcoding and processing at any point in the content chain, from production to distribution. SelenioFlex complements our SelenioNext¢ high-density ABR transcoder and SelenioEdge¢ content delivery network software, forming a robust OTT and TV Everywhere solution offering. As consumers around the world continue to adopt OTT and TV Everywhere services, and technical standards continue to evolve, media enterprises need enabling solutions they can rely on to meet their requirements both now and in the future. Software-defined workflows enable efficient, profitable operations today with the flexibility to adapt to the evolving multiscreen requirements of tomorrow.